A new Brookings Institution report provides an unprecedented glimpse into the lack of potential for transit to make a more meaningful contribution to mobility in the nation's metropolitan areas. The report, entitled Missed Opportunity: Transit and Jobs in Metropolitan America, provides estimates of the percentage of jobs that can be accessed by transit in 45, 60 or 90 minutes, one-way, by residents of the 100 largest US metropolitan areas. The report is unusual in not evaluating the performance of metropolitan transit systems, but rather, as co-author Alan Berube put it, "what they are capable of." Moreover, the Brookings access indicators go well beyond analyses that presume having a bus or rail stop nearby is enough, missing the point the availability of transit does not mean that it can take you where you need to go in a reasonable period of time. 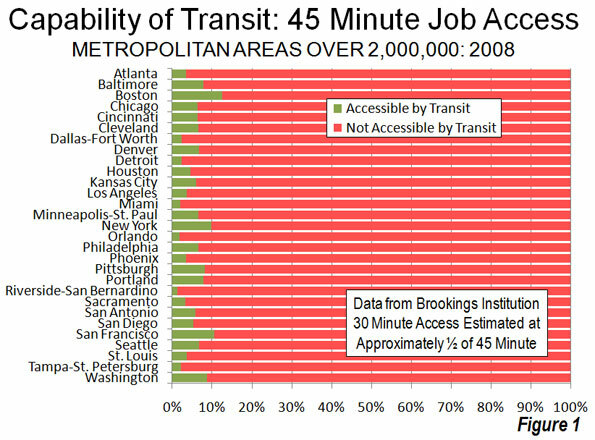 Transit: Generally Not Accessible: It may come as a surprise that, according to Brookings, only seven percent of jobs in the nation's largest metropolitan areas can be reached by residents in 45 minutes during the morning peak period (when transit service is the most intense). Among the 29 metropolitan areas with more than 2,000,000 population, the 45 minute job access average was 5.6 percent, ranging from 12.6 percent in Boston to 1.3 percent in Riverside-San Bernardino. The New York's metropolitan area's 45 minute job access figure was 9.8 percent (Figure 1). Brookings did not examine a 30 minute transit work trip time. However, a bit of triangulation (Note 1) suggests that the 30 minute access figure would be in the range of 3 to 4 percent, at most about 4,000,000 jobs out of the more than 100 million in these metropolitan areas. At least 96 percent of jobs in the largest metropolitan areas would be inaccessible by transit in 30 minutes for the average resident (Figure 2). 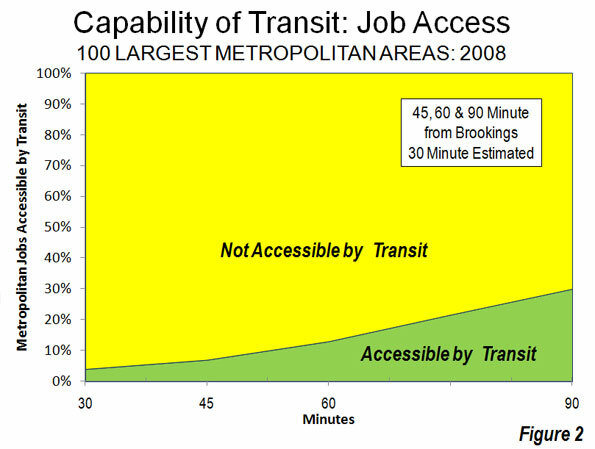 The Brookings report also indicates that indicates that 13 percent of employment is accessible within 60 minutes by transit and 30 percent within 90 minutes (Note 2). Brookings focuses principally on the 90 minutes job accessibility data. However, the reality is that few people desire a 45 minute commute, much less one of 90 minutes. In 2009, in fact, the median one way work trip travel time in the United States was 21 minutes (Note 3). Approximately 68 percent of non-transit commuters (principally driving alone, but also car pools, working at home, walking, bicycles, taxicabs and other modes) were able to reach work in less than 30 minutes. The overwhelming majority, 87 percent, were able to reach work in 45 minutes or less, many times transit's seven percent. 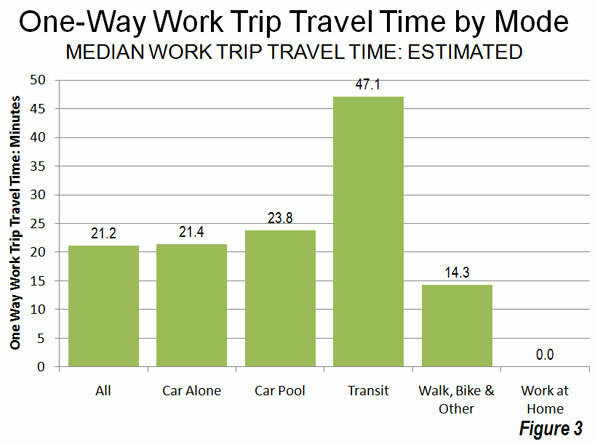 Transit's overall median work trip travel time was more than double that of driving alone (Figure 3). A mode of transport incapable of accessing 96 percent of jobs within a normal commute period simply does not meet the needs of most people. This makes somewhat dubious claims that transit can materially reduce congestion or congestion costs throughout metropolitan areas. The Brookings estimates simply confirm the reality that has been evident in US Census Bureau and US Department of Transportation surveys for decades: that transit is generally not time-competitive with the automobile. It is no wonder that the vast majority of commuters in the United States (and even in Europe) travel to work by car. 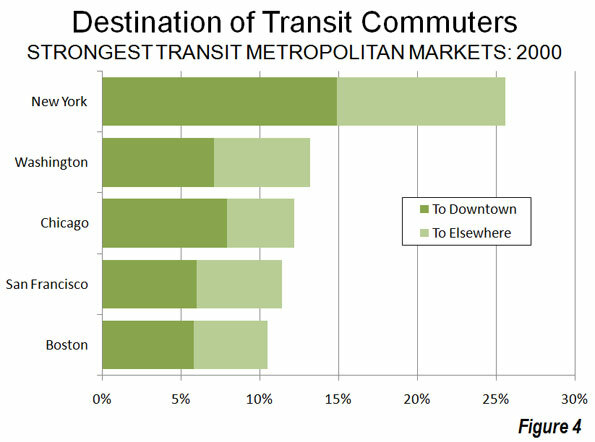 Much of the reason for transit's diminished effectiveness lies in the fact that downtowns --- the usual destination for transit --- represent a small share of overall employment. Downtown areas have only 10 percent of urban area employment, yet account for nearly 50 percent of transit commuting in the nation's largest urban areas (Figure 4). Meanwhile, core areas, including downtown areas, represent a decreasing share of the employment market as employment dispersion has continued. Since 2001, metropolitan areas as different as Philadelphia, Portland, Dallas-Fort Worth, Salt Lake City, Denver and St. Louis, saw suburban areas gain employment share. Even in the city of New York, outer borough residents are commuting more to places other than the Manhattan central business district (link to chart). Transit: The Long Road Home: Transit problem stems largely from its relative inconvenience. In 2009, 35 percent of transit commuters had work trips of more than 60 minutes. Only six percent of drivers had one way commutes of more than 60 minutes. For all of the media obsession about long commutes, more than twice as many drivers got to work in less than 10 minutes than the number who took more than an hour. In the case of transit, more than 25 times as many commuters took more than 60 minutes to get to work as those who took less than 10 minutes. Economists Peter Gordon and Harry W. Richardson have shown that the continuing dispersion of jobs (along with residences) has kept traffic congestion under control in the United States. Available data indicates that work trips in the United States generally take less time than in similar sized urban areas in Europe, Japan, Canada and Australia. "And those who left didn't move to nicer areas. Pushed out by gentrification, most settled on the city's eastern edges, according to the census data, where the sidewalks, grocery stores and parks grow sparse, and access to public transit is limited." Realistic Expectations: More money cannot significantly increase transit access to jobs. Since 1980, transit spending (inflation adjusted) has risen five times as fast as transit ridership. A modest goal of doubling 30 minute job access to between 6 and 8 percent would require much more than double the $50 billion being spent on transit today. Moreover, there is no point to pretending that traffic will get so bad that people will abandon their cars for transit (they haven't anywhere) or that high gas prices will force people to switch to transit. No one switches to transit for trips to places transit doesn't go or where it takes too long. Nonetheless, transit performs an important niche role for commuters to some of the nation's largest downtown areas, such in New York, Chicago, Boston, San Francisco, and Philadelphia. Approximately half or more of commuters to these downtowns travel there by transit and they account for nearly 40 percent of all transit commuters in the 50 largest urban areas. Yet for 90 percent of employment outside downtown areas, transit is generally not the answer, and it cannot be made to be for any conceivable amount of money. If it were otherwise, comprehensive visions would already have been advanced to make transit competitive with cars across most of, not just a small part of metropolitan areas. All of this is particularly important in light of the connection between economic growth and minimizing the time required to travel to jobs throughout the metropolitan area. The new transit job access is important information for a Congress, elected officials, and a political system seeking ways out of an unprecedented fiscal crisis. A four percent solution may solve 4 percent of the problem, but is incapable of solving the much larger 96 percent. 1. For example at difference between transit commuters reaching work in less than 30 minutes and 45 minutes, Brookings employment access estimate of 7 percent at 45 minutes would become 3 percent at 30 minutes. 2. The Brookings travel time assumptions appear to be generally consistent with data from the Census Bureau's American Community Survey (ACS) and the US Department of Transportation's National Household Transportation Survey (NHTS). Brookings, ACS includes the time spent walking to transit in work trip travel times (For example, the ACS questionnaire asks respondents how long it takes to get from home to work and thus includes the time necessary to walk to transit). 3. Median travel times are estimated from American Community Survey data for 2009 and includes working at home. The "median" is the point at which one half of commuters take more time and one-half of commuters take less time to reach work and is different from the more frequently cited "average" travel time, which was 25.5 minutes in 2008. 4. Is Transit Better in Smaller Metropolitan Areas? It is generally assumed that transit service is better in larger metropolitan areas than in smaller metropolitan areas. Yet, the Brookings data seems to indicate the opposite. Larger metropolitan areas tended to have less job access by transit than smaller metropolitan areas. In the largest 20 percent (quintile) of metropolitan areas, only 5.5 percent of employment was accessible within 45 minutes. This was the smallest quintile accessibility score, and well below the middle quintile at 9.2 percent and the bottom quintile at 8.3 percent. The top quintile included metropolitan areas with 2.6 million or more people, the middle quintile included metropolitan areas with 825,000 to 1,275,000 population and the bottom quintile included metropolitan areas between 500,000 and 640,000 (Figure 1). This stronger showing by smaller metropolitan areas probably occurs because it is far less expensive for transit to serve a smaller area. Further, smaller metropolitan areas can have more concentration in core employment. Even so, smaller metropolitan areas tend to have considerably smaller transit market shares than larger metropolitan areas. Submitted by whatsappu9 on Mon, 06/30/2014 - 08:31. Zero - Aliasing makes the borders of 3D things simpler . Whatsapp So your changeover between its own history and a thing, as an example, is substantially simpler the picture elements which might be located in the borders of an item are combined together with the encompassing picture elements. Submitted by WHATSapp1042 on Fri, 06/27/2014 - 06:47. Producing successive structures as a 3D sport called ' provide’. Making above teapot for the graphics card is going to have little career . In a game with relocating men , hills, sky , in-depth shadows , etc is distinct. The videocard can implement techniques and outcomes for greater images showing off and also to enhance the functionality of the videocard. In other words the whole image is in a chance - antialiased time. Frequently you'll be able to get different a strong point of anti aliasing environment in a game title. In the example above (Battlefield 2) you’re able to select between n-one, 2x or 4x FSAA. Anti aliasing features an adverse effect on the operation of the sport. Anisotropic filtering anisotopische selection is a strategy to hang in there. Feels clean and amazing about an object (3D wire-frame) It enhances the appearance of the feels as they can be at a terrific space or whenever they rest on an inclined aircraft in accordance with the ' perspective ' . Anisotropic filtering is the graphics controller is an incredibly demanding occupation. It's going to reach the overall game more delightful in look; nonetheless, it is going to have damaging sway in the velocity. The above outcomes would you fall upon on modern movie cards. You'll find lots of additional techniques which use video cards to accentuate the picture be it to improve the operation (which is finally a positive impact in the image). Speedier movie Card-Some of the techniques are specific to some special manufacturing company. In order never to fall under complex explanations and definitions in this post I shall adhere to these practices. Submitted by nayelialexa on Tue, 07/16/2013 - 15:00. I loved what you've done here. The design is elegant, your content classy. Yet, you've got an edginess to what you're offering here. Ill definitely come back for more if you keep this up. Don't lose hope if not too many people see your vision, know you've got a fan right here who values what you've got to say and the way you've presented yourself. Submitted by nayelialexa on Tue, 07/09/2013 - 07:37. Well, this is really a nice post.I really like the way you start and conclude your thoughts. Thank you so much for this information. keep posting such good stuff. Submitted by applee on Sat, 04/13/2013 - 14:39. I have heard a lot about this but today after reading this article I came to know some of the essential aspects about it. Lovely information. Submitted by applee on Sat, 04/13/2013 - 14:37. I would like to say that your article is awesome. You have good command on the topic. I will tell my friends about your website. Thanks for posting. Submitted by max.leonetti on Fri, 08/05/2011 - 13:27. I agree with the numbers but the solutions seem very expensive and I don't know where we can find this sum of money. I enjoyed reading it. I will search for more information about this topic. I admire time and effort you put in your blog, I will forward the link to my friends at container transportation cis, because it is obviously one great place where I can find lot of useful info. Submitted by BjoernAbelsson on Wed, 07/06/2011 - 09:37. There is a very simple and cheap solution to congestion. Most of the cars on the crowded streets are carrying 75 percent - AIR. One person sits alone in a tonne-vehicle that easily can carry 4 or 5 people. This is ridiculously inefficient! Planned ridesharing does not work, though. It is inflexible and demands planning. Instant Ridesharing, on the other hand, is flexible and easy to use in a society where more and more people carry smartphones with gps and access to Internet. You simply dial a code that tells where you are, where you want to go and whether you want to drive or ride as a passenger. Within seconds demands are matched and you get a message back with instructions where in your vicinity you can grab a ride or collect a passenger. The systems are already there. Avego and Citihaiq are two smartphone applications that can be downloaded to your smartphone today. The hatch is size. Instant Ridesharing needs volume to function. It is useless to share a ride with yourself. So there is a high threshhold to get over before the ball starts rolling by itself. A test site is in Portland, where Avego runs a large test. Also in Bergen, Norway a test is planned, but has had difficulties to start. We are trying to get a small scale test running in Stockholm this autumn, but we still have some issues that are not solved, like permission for HOV:s to use the bus lanes. But there is no alternative. Public transport is too expensive and new roads only increases car traffic. Ridesharing is the answer, and the only possible answer. Submitted by MAP on Sat, 05/28/2011 - 08:21. The rearrangement you're talking about will happen mostly privately and organically. Pre-1890 most urbanites lived within 3 miles of a downtown center. Why? 3 miles is a general round trip walking distance...as a maximum, and most people planned their trips to be shorter than that. As a result land prices were higher closer to any city center. The wealthy lived downtown (next to the core) and each lower class lived farther and farther out from the center until you hit farmland generally 3-4 miles from downtown. Keep in mind nothing was ever built in a perfect ring and distances are approximate but based on land use that revolved around foot traffic. In-fact the reason we have skyscrapers is because there was an incentive to build upward to maximize that fixed amount of land. You say that ridership pre-1890 might only have been 4%, but 1. how many people lived in urban areas and 2. how many people still chose to walk when transit was available or still too expensive (if you make a $1/day and a bus ride cost 5c I'd say that's a huge cost whereas walking has always been free -time). Post 1950. We see cars really take hold and become affordable. No longer did people HAVE to use buses and subways and light rails to get around and suburbia, organically, developed. But mass transit lines couldn't be everywhere at once and now you have a situation where less than 10% of people CAN effectively use mass transit (to get from home to work I'd have to take 3 bus lines, or the metro, the light rail then a bus. Same with getting to school in Towson which doesn't even have it's yellow LR line built next to it. Not very appealing when I can get to either in 15-25 min. by car depending on time of day). If the automobile goes to the wayside people will consciously move back to where the transit it. Thus property values around transit will adjust and govt. will have an incentive to make it viable. I too hope that this'll be the case politically. Businesses and offices will make decisions to locate where transit lines intersect. It'll cost money, but it'll happen organically and will be largely a private choice just as businesses pre-1890 almost certainly had to be in or near downtown to absorb enough foot traffic to make them profitable. The same will happen with transit. Gotta go near your customers, and if they're using transit that's where they'll be. Values will rise in downtown areas again and they'll become safe and vibrant. There's something to be said for community unlike the scattering in suburbia that we have now. There's also something to be said for concentration as people closer together, perhaps even riding together, will share ideas and business opportunities. With Urban areas across the globe having recently gone over 50% of the population I'd say it's time for a change. The US is 80% urban, we just have really spaced out urban areas which reflect our transit choices. Submitted by Chez Nation on Fri, 05/27/2011 - 17:57. For those who like public transit both in concept and actually riding it, one is faced with the fact that rearranging America's spatial pattern to align with public transit routes would cost trillions of dollars. The effort to increase national ridership from 4 to 5 percent, still means 95 percent is disbursed automotive. But when was this ever different? In 1880, when most of America was rural, what do we think public transit ridership was? 4 percent might be a good guess. Private car and road transportation is and will remain the best option for (1) rural parts of the world, and (2) suburban parts of the world. For the 20 percent that is in dense cities, transit systems are great and part of the experience of being in a city. It just turns out that in the United States, the dense transit oriented places, like New York City, San Francisco, and Chicago, only represent ten percent of the population and only a couple thousand square miles of land.